Newsflash: security in the Internet of Things calls for a completely different approach than that used for “traditional” Web-centric IT. 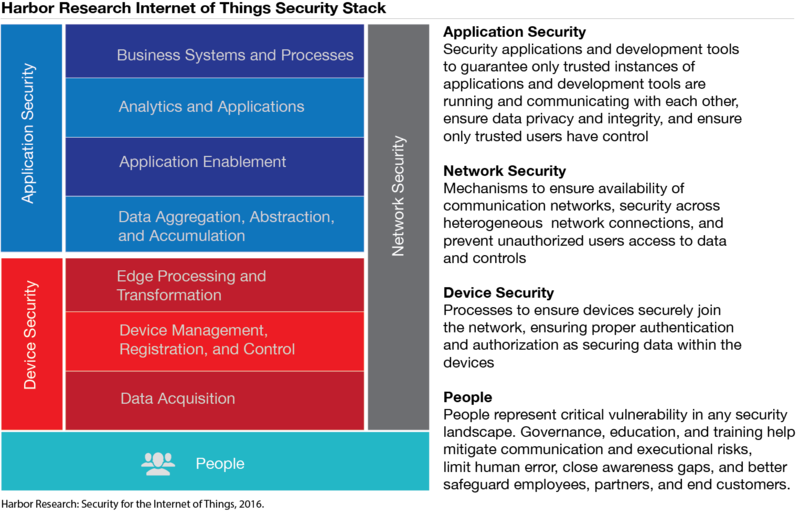 As objects, people, infrastructures and environments in the physical world around us grow more digitized, the approach to security requires a shift, a shift from IT security architecture to IoT security architecture. Question 1: What are we trying to protect? By its very nature, the Internet of Things is not singular to one piece of technology, one business unit or one vertical. Rather, to deploy and connect devices, objects or infrastructure in an enterprise or consumer context inherently implies connections between multiple endpoints. Any connected application, whether a connected thermostat in your home or a fleet of sensor-clad wind turbines in the field, includes some configuration of devices, applications, networks and, of course, people. 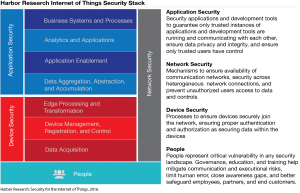 When taking inventory of the threat surface (i.e., the landscape of potential vulnerability), organizations must assess risks across the “IoT Security Stack.” These areas aren’t just technological system components, but also the people and organizations who participate in the system, both internally and amongst partners. While device, application and network (i.e., technological) security are central to safeguarding any connected landscape, people represent another critical aspect of security that is often overlooked. Password security, BYOD environments, employee churn, lack of security training and simple human error are among the many risks that the human dynamic presents in any system. Remember, in the Internet of Things, a secure system is only as secure as its weakest endpoint. Empowering people helps strengthen security. This is a critical first step to developing a security strategy. Question 2: What would happen if our “smart” system was compromised? They should also have a formalized plan in place for external communications about data-related crises — to partners, media and, most importantly, customers and end users. As security practitioners plan for the what-ifs, they must recognize that IoT security requires a multifold approach that addresses legacy, current and emerging security challenges at once. First, organizations must meet traditional IT security challenges associated with legacy architecture and environments. Next, they must address the challenges introduced by our current generation of technology, characterized by cloud, social and mobile. Finally, as computing interactions and interfaces proliferate, as new classes of technologies emerge and as these interactions drive entirely new economies, organizations have an obligation to at least attempt to address the unforeseen, unintended and uncharted consequences of such digitization as best they can. Question 3: What does personally identifiable information mean anyway? 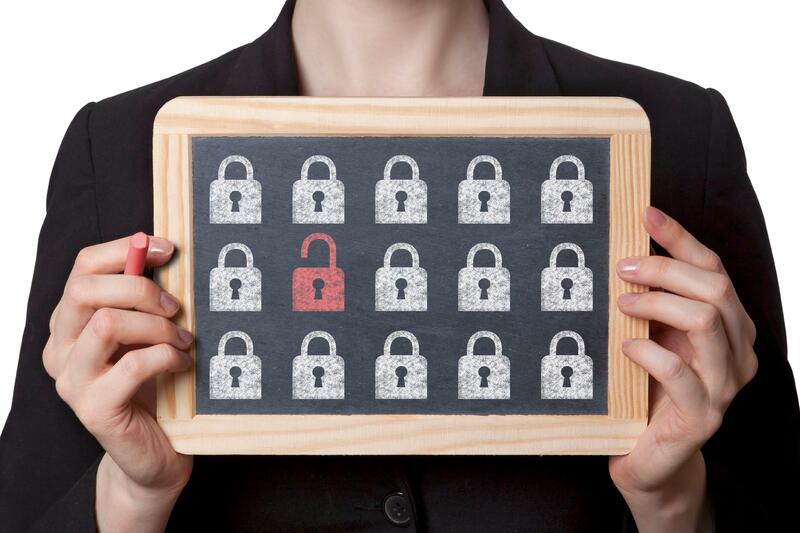 Virtually every connected environment involves some element of personally identifiable information, also known as PII. If not data transmission, then data integration; if not integration, then employee or end-user associations. But thinking about security and privacy in IoT requires that we reconsider the very composition of personally identifiable information. As we transcend the laptop and digitize objects and environments, as we juxtapose, integrate and monetize diverse data sets from diverse environments, what is or may be “personally identifiable” is far less black and white. What is clear is that sensing technology is architected to sense physical realities: location, acceleration, temperature, heartrate, moisture, sound, light, position … the list goes on. And when these inputs are viewed in contextual spheres greater than themselves, they tell stories greater than themselves. Fitbit’s ability to track steps and heartrate generated the same data that revealed its users’ sexual activity patterns, for example. The company quickly made such data — initially default set to public — private in response to outcry. Are my comings and goings from my home personally identifiable? Is the way I drive my car personally identifiable? Are my biometric responses to stimuli personally identifiable? Advertisers, insurance companies, manufacturers, retailers and employers are all vying to gain as much empirical context as possible, but where do we place technological limitations in favor of human sensibilities? While no single organization can definitively answer these questions for every context, it is in its best interest to analyze the implications for use cases generating such data and how to manage and safeguard this data. In the event of a data breach, data malpractice or related crisis, such planning and documentation will help companies fare better in court. As businesses vie to collect as much data as possible, they must consider the unintended consequences of data collected and integrations with applications of such data. There are a variety of resources organizations can access to aid with each of these questions, but approaches to IoT security will vary. To aid in the quest to truly secure “Smart Systems,” Harbor Research has developed a three-step process to guide organizations in their approach to IoT security, accessible in full here. While each of the above questions is central to an IoT security strategy, you might have guessed they are far from easily answerable checkboxes. Businesses must begin by assessing existing infrastructure, current development initiatives (including product, process and people), and align these against a larger enterprise strategy for both security and privacy protection. Forward-looking IoT security strategies begin with product design, but like IoT itself, they transcend products, across services, stakeholders, customer segments, threat vectors and lifecycles. What gets you excited? A great meal at a famous restaurant? The Stanley Cup? What about smart cities? Perhaps, but more than likely, you don’t really spend much time thinking about it, much less get excited about it. That is understandable, but a glimpse into where we are headed might just might prove exciting, if not horrifying. For me, the idea of smart cities is certainly exciting, but it is also horrifying at the same time. Allow me to explain. At a basic level, most people think of smart cities as ones where sensors have been deployed in a number of different functions that provide an element of control and response to certain conditions ostensibly making life better for its citizens. They might have traffic lights that operate in sequence and can sense when there are cars at the light allowing traffic to flow better than it would otherwise. Almost all cities employ this in varying degrees. They might have garbage cans that alert the city when they are close to being filled, thereby reducing the city’s operating costs while ensuring the garbage cans stay available. They might have sensors on the public buses feeding a transportation application so you can know when your bus is arriving or running late. They might be deploying environmental sensors to measure air quality in neighborhoods or water quality at the beaches to know when there are issues that need to be addressed, like closing the beach. There could even be sensors in parking spaces, where drivers can more easily locate available spaces instead of driving around creating more traffic and burning more fuel. But there are other elements to smart cities that have more to do with planning and architecture. For instance, there might be a well-planned system of bike paths through the city, complimented by a large-scale bike share program, which is true in many cities today. There might be building codes and corresponding tax policies to bring about much more energy efficient “green buildings,” which is also becoming more and more prevalent. Still yet, there might be other policies discouraging passenger cars inside the city in lieu of public transportation (such as the fees charged in London for bringing your car into the city), or there might even be a well-thought-out system of parks and green areas — the opportunities are endless. There are examples all around us that are really cool. In a nutshell, they are generally a function of a well-considered plan to make the city more livable and productive for its citizens through infrastructure, laws and certainly technology. But more and more, we are beginning to see these in combination, and the rate at which these ideas are becoming a reality is impressive. Transportation is a great example. For instance, the bike share programs are becoming more expansive, but also highly instrumented, both in the bikes and the bike stations. Most public transportation modalities (buses, trains, subways, ferries) are being built or retrofitted with technology for tracking, as well as many other functions to improve the quality of service and cost of operating the asset. People are coming to expect that they can use their cell phones to understand when the next train will be or if there are delays, and even to purchase their electronic ticket. The street lights along the roads are changing colors, from the costly yellow of sodium vapor lights to bright white LED lights. These are not only more energy efficient, but they are connected, meaning the city can know their status (Are they on or off? Is there a problem?). And they can also be aware of their surroundings — for example, the hockey game ends, so the lights get brighter for the fans coming out into the streets. They might even blink in a certain pattern to alert drivers and pedestrians of an oncoming emergency vehicle. Moreover, the light poles are no longer just light poles. They are charging stations for electric vehicles. They are Wi-Fi hotspots that can “talk to your cars,” and your cars can talk back to them — e.g., your car hits a pothole and tells the city via the light pole. The city then tells the cars ahead of the pothole that either results in the car avoiding the pothole altogether, or adjusting its suspension dynamically in anticipation. Then there is the data. Data can be both the kryptonite as well as the Holy Grail. For starters, I would be shocked if there is not a shift to provide control — if not outright ownership — of the data by those deploying the IoT-enabled equipment (as opposed to those providing it). In the specific case of cities, this means the city and its citizens. The more thoughtful architectures will deploy with the ability to combine many elements of this data for deeper interrogation and analytics. In other words, there will be a separation between the creation of the data and the consumption of the data. But the key value is in the data. So the obvious questions become who controls that, and what are they doing with it? There are many opinions on this. Certainly there are large technology companies investing in the infrastructure that feel it is advantageous to own the data. That should not be surprising at all. The investment that goes into all this needs to be monetized, and owning the data is clearly one way to get there. But the early projects and associated familiarity and learning that goes along with these efforts has begun to expose this consideration, and the potential controversy associated with it. Concerns ranging from privacy to the ethical considerations around having a specific company becoming the primary beneficiary of a publicly funded initiative has evoked a certain amount of pushback. People don’t want Big Brother, although there are clearly some elements of this that are undeniable, so the importance of considering this thoughtfully and deliberately increases. For starters, the data being collected today will pale by comparison to the data being collected tomorrow, yet what is collected today is not insignificant. For instance, think of the license plate reading technology available today that can identify your movements. Is that bad? It isn’t for certain purposes — as some will say, if you are not doing anything wrong, you should not be worried about it. And there are certainly legitimate reasons for this type of technology, most notably toll collection on highways. But when the data is expanded to beacon technology or drones or other combinations of advanced technology capable of tracking your individual movements, then where is the line drawn? Does that help the police? It does. Does it help with city planning? It does. What about modeling population behavior so you can better anticipate and accommodate everything from facilitating a safe and efficient flow of people and vehicles — for example, after the air and water show with a million people along the shoreline to the effective deployment of emergency resources in the event of a hazardous waste spill downtown? These would be capabilities that would benefit everyone. But do you want your specific behavior combined with other information about you to be categorized and sold so that Uber, Abercrombie or Subway can target you for advertising? Instinctively you probably do not, but if you are unaware this is going on and you “happen” to see ads that attract you, you may unconsciously like that and benefit from it. This is a not so future world rendering of what happens today on the Web. The point is that it is a perilous journey that must be carefully considered. That said, the likelihood of not making the journey is virtually zero. This is going to happen, so the thoughtful consideration and planning is critical. How we approach smart cities will be extremely important. Security is incredibly important since the cost of getting it wrong in the future will be significantly greater. Privacy is clearly a key factor for citizens, and this will play out in many public forums, but we can expect to learn from early efforts, good and bad. Europe in particular has seen good work done here, especially in cities like Stockholm, Barcelona and Amsterdam. Many more projects are cropping up and all offer opportunities to learn and evolve. We are beginning to see this in North America as well. The Array of Things project in Chicago appears to have great potential, but the implementation was not rushed — and in fact, slowed down to ensure that privacy, among other considerations, was properly vetted both in terms of policy as well as the public messaging around it. And in this case, there is a long and growing list of other cities waiting to follow suit with the Array of Things in their cities. In some ways, the whole idea of smart cities is like a very powerful energy source. It can be harnessed and used to enable good things on a larger scale, but can also do untold damage when the motivation is bad and the control is in the wrong hands. One thing is for certain, our cities are changing forever at an increasing rate, and there is no looking back. I am fearful — and yet excited and certainly optimistic. The Internet of Things can land intrepid organizations in some top-flight destinations, but an IoT initiative at a company such as Air Canada can take many years of planning to take wing. At the Connected Things 2016 event Tuesday in Cambridge, Mass., a panel outlined an IoT initiative that tags Air Canada Cargo’s shipments with RFID-enabled sensors. Experts on the panel, held by the MIT Enterprise Forum of Cambridge, said the deployment integrated temperature and humidity sensors within cargo shipments. This not only improved customer service and decreased losses, but also helped ensure ongoing compliance as regulations change. Barb Johnston, Air Canada Cargo’s manager of operational programs, said the project took nearly eight years to complete, building the business case over time with a series of steps: mapping manual processes, overlaying them with appropriate electronic messages, and then conducting a pilot program on flights between Frankfurt and Montreal. “We did have to ask for a little bit of a leap of faith because of this ground-breaking technology,” Johnston said. However, Johnston says Air Canada Cargo is confident its investment will pay off in improved customer experience, reduced cargo loss and employee efficiency. According to Johnston, Air Canada Cargo is expected to grow 50% over the next two years. Thanks to its IoT initiative, the company has been able to automate certain manual processes, such as handwriting eight-digit codes for each piece of cargo shipped, enabling the company to improve operational efficiency and more effectively use its staff. A “glass pipeline” is critical to a successful IoT initiative, Tom Zurick, director at Unisys Corporation, said. However, achieving this comes with many challenges, such as accommodating labeling between multiple providers, keeping up with regulatory guidelines, creating too much data at the piece level, and the mere fact that RFID tracking is not available everywhere. How can that last problem be solved? “We’ve designed a solution with a high amount of flexibility,” Zurick said; flexibility that comes in terms of labeling at different points in the supply chain, adding barcodes to RFID labels for locations lacking RFID scanning capabilities, and removing clutter by consolidating piece IDs. The benefits far outweigh the challenges, Zurick said. There’s security and safety in knowing where every piece is, service that gives tracking capabilities to customers who want visibility, and revenue improvement through charging appropriate cargo costs. Mike Nicometo, CEO of CargoAware LLC, offered a “quick peek at what’s under the hood” of RFID tags. By replacing manual codes and barcodes with a label containing an embedded RFID card, he said, Air Canada and other cargo companies give digital identities to physical things. The key, Nicometo said, is using a variety of technologies to collect data from the cargo pieces. For example, real-time data can be captured at the “edge of the enterprise” not only using smartphones, tablets and computers, but also with RFID antennas. Air Canada Cargo’s RFID tags are read at three-second intervals. A specialized dashboard tracks cargo every step of the way from warehouse, to flight, to delivery. Eric Wood, vice president of product management at RR Donnelley, reiterated the importance of the ends justifying the means — and this takes patience and preparation. “All the ‘things’ are not the same,” Wood said. “You need to know different stuff about them: the information you want to gather from them, the insight you need to drive your business, the income drivers … they’re all going to be different for those things. “Go out and do some research and figure out what you’re trying to solve,” Wood said. Blindly adopting technology because it is “cool” will undoubtedly end in disaster. Air Canada Cargo certainly is reaping the rewards; Johnston said thanks to the successes seen, the company is deploying its IoT initiative across 92% of its market over the next two to three years. A number of factors influence consumer perspectives on privacy and data, and concerns vary for any particular brand or product category. Moreover, the general backdrop of headline news about data breaches and unauthorized data sharing raises the anxiety for some consumers, whether they are affected or not. An increasing number of consumers have actually become victims of identity theft, leaving them with a heightened concern for the real-world consequences of re-establishing identity and monitoring credit records for unauthorized purchases. Privacy concerns about certain devices vary by whether a consumer owns or intends to purchase the device, as opposed to someone with no actual experience with the device. Concerns rise once a consumer owns a device and becomes more familiar with its functions. Altogether, 47% of broadband households express privacy or security concerns about at least one smart home device. They express the greatest level of concern for the privacy and security of computers and tablets (43%), followed by smartphones (41%). The lengthy history of connectivity, data breaches, and the volume and variety of data stored and transmitted by these devices drives these concerns. Nearly as many respondents express concern about relatively newer smart entry devices (door locks, garage openers) (40%) and home security systems (38%). U.S. broadband households expressed significantly lower levels of concern for thermostats, lights, and HVAC systems (25%), and connected CE devices (24%). Notably, despite stringent HIPAA requirements in the health sector designed to protect consumer health data, respondents express the lowest level of concern for connected fitness devices and connected health devices, each earning a 23% concern rating. Device ownership and purchase intentions are the best indicators of a consumers’ level of privacy and security concerns. Privacy and security concerns do not differ drastically by age group. Smart home device owners are more likely than non-owners to have concerns, suggesting that concern rises when ownership creates the real possibility of compromise. Those intending to purchase a smart home device also report significantly higher concerns for privacy and security versus those with no intention to purchase, implying privacy concerns are more top-of-mind for those in the market for devices. A similar pattern exists for other device categories, with an approximate 50% increase in concern level among those who own connected devices. For instance, 20% of smart TV non-owners express privacy and security concerns versus 30% of smart TV owners. In the health devices category, security and privacy concerns among connected blood pressure cuff non-owners (22%) increase by an even greater margin for owners (43%). When specific privacy and security concerns are considered, concern for “identity theft or data hack” ranks as the first or second leading concern in eight of nine connected device product categories. Regulators, advocacy groups and forward-thinking industry players have championed the notion of a consumer bill of privacy rights. However, when a variety of specific privacy rights are presented to consumers, no one privacy right alleviates the concern of more than one quarter of consumers. Still, combining at least three privacy rights alleviates almost three quarters of consumer concern. Adding together consumers who have no privacy or security concerns with those whose concerns are relieved by the right to be invisible, the right to approve who uses the data and the right to be erased, relieves concern for 73% of consumers. Further, simply giving consumers the ability to opt-in or opt-out of data collection and still use the product or service alleviates most of the concern. Sales of connected devices are exploding. The massive amount of data available from connected devices creates an unprecedented opportunity for new products, value-added services, new partnerships and new ways to use data. Consumer concern for data privacy and fears of hacked data loom larger than other concerns for connecting devices to the Internet, and high levels of security may become a differentiator for many new connected products. The Internet of Things, food quality and food safety take on another dimension at Freight Farms, a Boston company that provides a farm in a box — or, more specifically, a 40′ x 8’ x 9.5’ shipping container. The company’s container farms provide climate control, lighting and a hydroponic system, enabling customer-farmers to grow leafy vegetables year round. The containers, according to Freight Farms, are optimized to grow herbs, different varieties of lettuce and other vegetables such as kale and cabbage. IoT wasn’t in the picture when Freight Farms launched in 2010, but the technology has become increasingly central to farm management. The era of the “connected refrigerator” may have arrived, but Mark Roemers, co-founder of Netherlands-based AntTail, has simply given up on consumer refrigerators, smart or otherwise. They don’t cool evenly, with a dozen or more degrees Fahrenheit temperature difference between storage in the door and storage in the back of a typical refrigerator — more than enough to allow for degradation of certain medications. And AntTail, which focuses on pharmaceutical logistics, is all about keeping medicines fresh. Part of its partnership with one of the major pharmaceutical suppliers in the Netherlands is to supply small drug storage coolers to individual patients to use in their homes. Using refrigerators, more than 90% of patients don’t store their medications within the safety margin. Using the dedicated cooler turns that statistic exactly on its head. AntTail knows this because it tracks the temperature continuously and monitors when the drugs are accessed for use. The company has developed a small sensor that fits inside the sealed package in which pharmacies deliver drugs to patients. The sensor device, which looks somewhat like an overgrown SD card, not only tracks temperatures, but also incorporates a light sensor so it knows when the package it resides in has been opened. With a life between battery changes of 18 months, it’s something of a textbook example of these sorts of communications and power-consumption issues that real-world IoT devices must deal with. AntTail’s sensor device is matchstick small. Note ant on match head. We’re pretty sure the ant is important. The first casualty of power requirements for AntTail, Roemers says, was industry standards. The company really couldn’t use conventional wireless standards such as Wi-Fi, Bluetooth, Zigbee or Z-wave– it’d have only managed six months or so of life from the CR2032 batteries that its sensors use — and thus have invented its own proprietary network. “There’s a big need for someone to come up with a standard for very efficient wireless communication,” Roemers said. The proprietary AntTail protocol is unusual in that it doesn’t use addressed-based routing the way IP-style networks do. Instead, each device monitors the hop counts of packets traversing other nearby units (this is a mesh architecture) and sends packets to devices that it knows are “upstream” in relation to an aggregator (think, roughly, of a Wi-Fi access point). The aggregator then uses a cellular data connection to send the sensor data to the cloud. If the company had chosen a standard protocol for local connection to the sensors, Roemers said, it would have been Zigbee, but then “all the equipment would be six times larger” because of the extra batteries needed. Data from the sensors is collected in the cloud and, of late, some of it is shared back to patients by way of a smartphone app, which helps with reminders to take medicines on schedule. At present, there are only about 1,000 sensors in the field, but the deployment is doubling monthly. One downside: fully one half of the sensors are thrown away by patients who forget that they are inside the foil pack containing the medicine. AntTail notes that they do typically get a couple of trips to the end user and back before they go astray. Still, at thirty euros a throw for the sensor units, IoT medicine delivery is still a pricey proposition. With this post, I am pleased to join TechTarget IoT Agenda as a contributor; I hope to post to the community monthly. My background is in IT operations as a practitioner for 17 years, then moving to an analyst role at Gartner for three years. Currently, I’m helping to drive vision, strategy and roadmap at AppDynamics, an application intelligence software company focused on application performance monitoring and analytics. This post analyzes some key data and predictions for the IoT market, and helps frame segmentation and IoT spending in IoT project phases. The Internet of Things has some traits in typical applications, but also introduces some significant new challenges. With typical applications, users interact directly and data is collected inclusive of the specific actions the user is taking as they engage with the app. This means the app is only emitting data for small, more definitive timeframes. IoT systems, on the other hand, often emit data when they are at rest — especially in the case of consumer systems. Gartner segments IoT spending (you must be a subscriber to access) between connectivity of “things” — typically via mobile networks or Wi-Fi — and two major market use cases: consumer and professional. As the data shows, the professional market is over 50 times larger than the consumer market. Gartner predicts that “manufacturing and natural resources” is the largest segment by total spend, estimated at $95 billion in 2016 and projected to grow to $136 billion by 2020. By comparison, the entire consumer segment is estimated to be $7 billion in 2016 and projected to grow to $39 billion by 2020. In many cases, these industrial systems do not rest often, and hence provide a larger opportunity — and significant challenge as well — due to both the size of the data and the value locked inside. Among these typically complex and often widely dispersed systems could be sensor-connected machines in factories, construction vehicles, mining equipment, oil and gas equipment, and robotics in manufacturing. Gartner has done additional interesting analysis, looking at how IoT is likely to evolve. As an IoT project gets underway and is in development, Gartner estimates that 20% of the project spend is focused on design and consulting, 35% on implementation and 45% on operations. As IoT evolves over the next four years, the ratio of that spending will shift more heavily towards operations. Gartner predicts that in 2020, the ratio will move towards 18% spend on design and consulting, 30% on implementation and 52% on operations. Operational costs are tied to analytics use cases, which are applied to the operations of IoT assets, including not only hardware or cloud services, but also software and services to enable infrastructure management, application management, device management, performance monitoring, remote diagnostics, authentication, billing and support. The purposes of these functional areas are to collect and analyze the data generated from IoT devices and create insights from it with algorithms and other views of the data. The reason for this shift is that the high value of IoT is within the analysis and insights derived from the collected data. Newer, more sophisticated algorithms and analysis require more computing and associated resources. The operational cost of increasing the number of devices, customers and ultimately users means more IoT spending on more storage, traffic and raw processing power needed to scale the IoT business. As the use of IoT projects ramps up, there are economies of scale at play. But the current models analysts are predicting still show that the cost of these services will be passed onto end users in the form of premium services and offerings. This will increasingly become a normal upsell tactic within IoT that has yet to take hold. Thanks for reading this post! Next time I’ll offer insights around device and data management, along with emerging IoT platforms. Please leave comments here or via twitter: @jkowall.